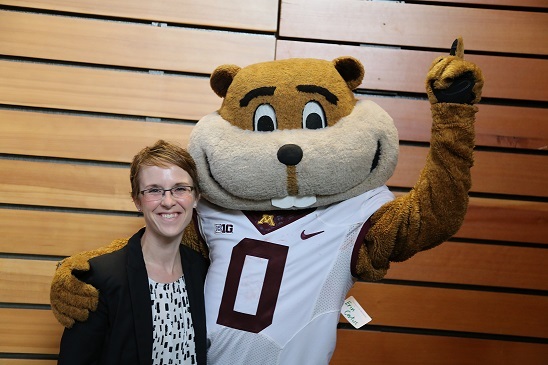 Erin Cortus joined the Bioproducts and Biosystems Engineering Department of University of Minnesota in August 2017. Her position as Assistant Professor and Extension Engineer will provide engineering expertise in the area of sustainable animal agriculture systems. Erin's research interests are the measurement and estimation of farm-level gas emissions, like ammonia and hydrogen sulfide, and the related impacts on the animals, workers and surrounding community. Her Extension mission is to work with producers and communities to understand and continually improve the environments that we raise livestock in. Erin was born and raised in Saskatchewan, Canada. She completed her Agricultural Engineering degree and PhD degree programs at the University of Saskatchewan. Throughout her undergraduate and graduate programs, she worked and studied at the Prairie Swine Centre near Saskatoon, SK. Working in both a research and swine production setting at the Prairie Swine Centre has led her to focus on how barn design and management links and simultaneously influences animal health and productivity, worker health and safety, and the surrounding environmental and community. Erin brings eight years of experience in a similar Research and Extension role at South Dakota State University. She was the coordinator for the statewide Environmental Training Program for Concentrated Animal Feeding Operations and worked closely with producers, counties and concerned citizens on questions and discussions related to odor and manure management. Her past and ongoing research projects have included measuring the air quality impacts of different manure management practices in beef cattle barns and the productivity impacts of providing additional cooling for grow-finish pigs.